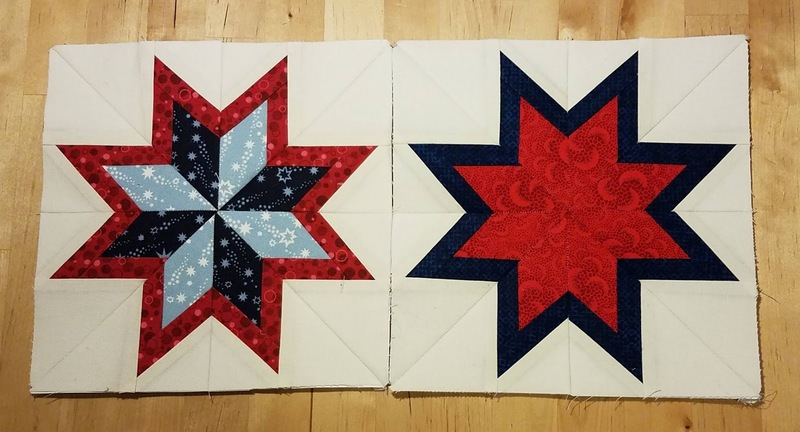 Star: You decide if you want to make a red star with blue accents or a blue star with red accents. You can use as few as one red and one blue fabric or make it as scrappy as you like. I have no problem with other colors in the fabric as long as it reads predominately as red or blue. Background: White solid or tone-on-tone. I’d prefer one background fabric in the block as opposed to a scrappy background. This is a paper pieced block. You can find the pdf here. You will need two copies of the page to make the block. 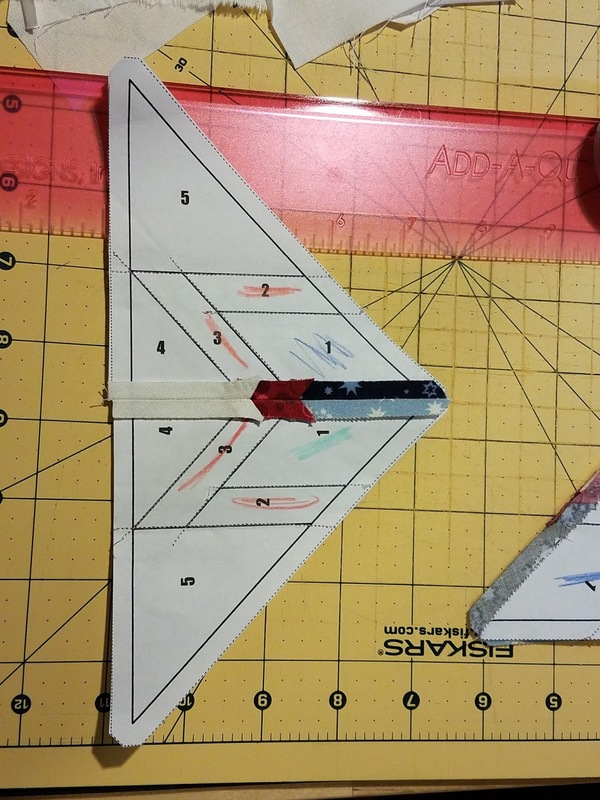 For those who have trouble visualizing, here is how the sections on the pattern break down: 1 is the star fabric(s), 2 & 3 are the accent fabric(s), and 4 & 5 are the background fabric. 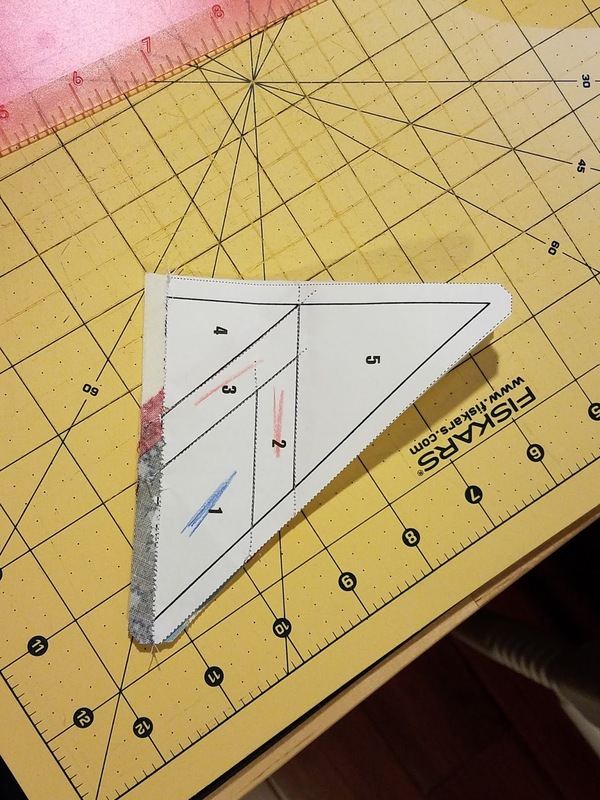 I know some folks don’t like or aren’t comfortable with paper piecing. Here are some tips that I hope will help. Tip #1: Use fabrics that don’t have a right or a wrong side. This immediately eliminates one of the mistakes that it is easy to make when paper piecing. If your fabric doesn’t have a wrong side, you can’t do it backwards! Solids and batiks both eliminate a wrong side and both are fine for this block. Tip #2: Because each section has the same elements, you can kind of chain piece which will (hopefully) help it feel less labor intensive and mean less back and forth. I sewed all 8 #2 pieces to the #1 fabric, then trimmed and cheater-pressed (see tip #3) and by doing it this way rather than one section at a time, it went faster. Tip #3: You don’t actually have to press each step. Really! I didn’t press my test blocks until I had the full segment done and you can’t tell, can you? I used this fabulous roller from Violet Craft and it meant that I didn’t have to get up from my sewing machine until all the segments were done! Don’t have a handy roller gadget? Maybe you have a pastry roller or small rolling pin in your kitchen that will work just as well. A solid finger pressing will likely also be sufficient. Tip #4: Need the visualization? Color on your pattern! You can see that I didn’t color all the way in, just marked a little section, but on more in-depth designs I color it all in like a coloring book. It helps me visualize, as seeing a whole amid the pieces is not my strong suit. Tip #5: Remove the paper from the seam allowance. 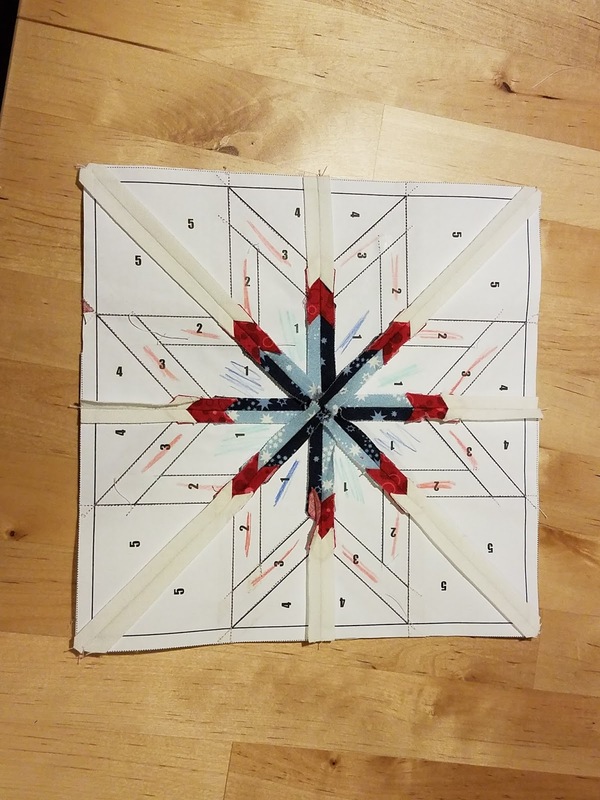 You can do this before or after you sew each set of segments together. This was a new one for me and it worked like a charm. Still worried? I’ll make you a deal. Set whatever you think is a reasonable amount of time. Work on the block for that long and stop when the time is up. Send me whatever you’ve done and I’ll finish it. Seriously. I do not want this to be source of stress for anyone. I can’t wait to see what you make! Thanks, everyone! ← Thank you Velda and Emily! I need to brush up on my paper piecing skills! I will be sorting through my reds and blues! I feel like I need to re-learn every time I sit down to paper piece! Wonderful block! Can’t wait to make it for you. 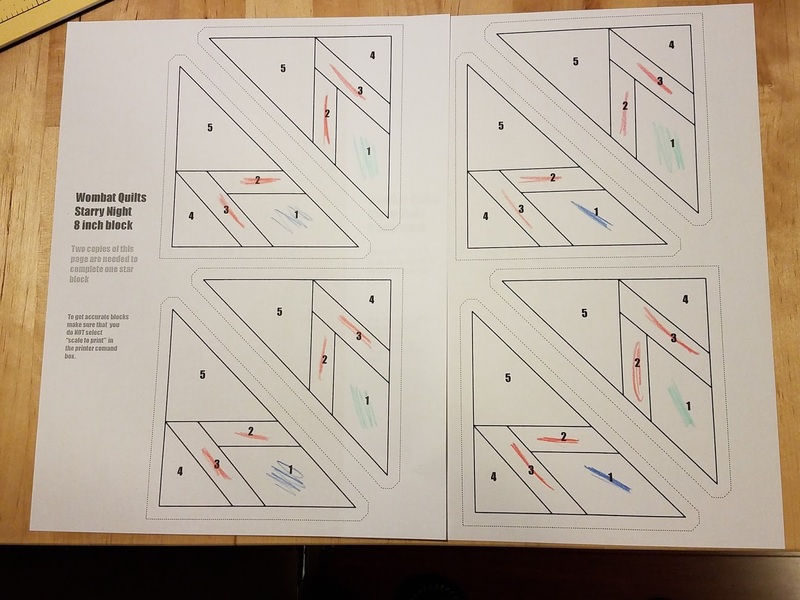 I have a tutorial with photos for each step if anyone needs a paper piecing refresher. Here’s a link. Thanks, Jennifer! I forgot about your tutorial. I was looking forward to making another shelf of books for you when it was your turn again. And I had such a good idea. Now you’ll never know. Ha! I didn’t want to make anyone repeat, but if you would rather make a bookshelf block than a star, I have no problem with that! I think June is the earliest I’ll be assembling the bookshelves, and it may end up being later than that. Your choice!